February 12, 2019 / Amnet New York, Inc.
Before going to Japan, you should know that renting a car or taking a taxi is very rarely needed. The reason for this is because of how extensive and efficient the trains are throughout the country. You can go almost anywhere without needing to do too much walking. However, there is one caveat to be wary of when taking the trains. There are so many different types of trains to the extent that it has even left Japanese citizens scratching their heads at times trying to comprehend which train to board. Would you be able to guess the difference between semi-express and limited express? Luckily, you do not need to guess since everything will be explained in this article. Railway companies in Japan sometimes use different names for the same types of trains, so those will be consolidated as best as possible for clarity purposes. Trains are divided up based on the number of stations they stop at. For example, a local train will stop at each individual station along its route, as opposed to the rapid train that will skip some of the less prominent stations. There are many other types not covered here such as commuter and luxury, but the names above are the ones you will come across the most. You will need to check each line’s route map to see which stations you will stop at when boarding one of these trains. Although the maps will be color-coded and translated in English for your benefit, they can still be confusing, so make sure to double-check before deciding to get on a train. November 14, 2018 / Amnet New York, Inc.
Just like any form of transportation, trains have their own etiquette to follow. As Japan is a nation that takes manners quite seriously, be sure to act accordingly at all times. When getting ready to board, make sure to get in line and do not rush onto the train. It is very easy for accidents to happen if people rush on or off the train. In order to allow people to flow freely throughout the cabin, be sure to keep your luggage out of the aisles. Depending on the type of train you are riding, there may be places for your belongings. These areas can be above seats, under seats, and in between passenger cars. Regular commuter trains without assigned seats have “priority seats” that will usually be on the far left or right side of cars. These are meant for the elderly, the disabled, pregnant women, and women with small children. You are allowed to sit in these seats when no one is using them, but it is imperative to give them up when necessary. If you are riding on a train that has reclining seats, be mindful of the person behind you when moving back. When getting off the train, return your seat to its original position. Smoking is prohibited on all trains in Japan, and if you are riding a train that does not have a tray table for each seat, eating and drinking is looked down upon. Perhaps the most important manner of all is how to properly use your phone. Set it to silent at all times and do not talk on the phone around others. If the phone call is an emergency, go to the area between passenger cars or make it quick while talking quietly. By following this proper etiquette, you will blend in and not cause any disturbances while you ride trains in Japan. October 23, 2018 / Amnet New York, Inc.
Free public WiFi has long been a scarce commodity in Japan. Although the country is striving to improve in this area with the Tokyo 2020 Olympics drawing nearer, it is still lacking as compared to other nations around the world. Currently, the few places where you are able to access free public WiFi are at convenience stores, cafes, fast food restaurants, airports, major train stations, and hotels, provided you are a guest. For a fee, you can also access WiFi on bullet trains, in internet cafes, and in only a handful public areas in big cities. Almost nothing is more important in a foreign country than WiFi, so Amnet, partnered with Vision Mobile USA, is pleased to provide a portable WiFi device to give you peace of mind at all times during your trip. With plans starting as low as $2, this device is a cheap and convenient way to connect to the internet whenever you need it. The Vision Global WiFi device can be ordered online and delivered to your house before you depart, and you can return it using the enclosed return envelope. In-store pickup is available at our Costa Mesa, California location as well. The router is easily activated, and the WiFi can be shared across multiple devices. October 16, 2018 / Amnet New York, Inc. The legend of the maneki neko involves a feudal lord from the Edo period making his way through town when he came across a cat beckoning him under the shelter of Gotokuji Temple. The lord obliged and rested. A thunderstorm suddenly started, and thanks to the cat’s invitation, the lord stayed dry. Grateful for this deed, he donated enough money to help rebuild the temple and make it his family temple. Since that time, it is believed that the cat brings good fortune. After a 10-15 minute walk from Gotokuji station, you will arrive at the temple. Located in a corner of the temple is a space dedicated to the figurines. You will find rows and rows filled with cats of all sizes. Besides the main attraction of the maneki neko, the temple is the burial grounds of Ii Naosuke, a feudal lord most famous for signing the Harris Treaty with the United States in 1858, an agreement that opened Japan’s ports for trade with the West. Other points of interest at the temple include a three-story pagoda, which is decorated with a maneki neko figurine on the first level, and depending on the season, beautiful foliage can also be enjoyed. May 17, 2017 / Amnet New York, Inc. If you are not familiar with riding trains, subways and/or buses where you live, it may be a little difficult or confusing to figure out time tables when you travel Japan, where trains and buses are the main forms of transportation. Here, you will find some easy steps on how to figure out which train you can catch. Below is an example of a time table for the bullet train in Japan. This is for the West-bound trains, so you will be looking at this if you are in Tokyo for example, trying to reach destinations such as Kyoto, Osaka, Hiroshima, or Hakata. The top half and bottom half are 2 separate tables. Yes, the numbers are tiny. The train will depart at the very top, in this case, Tokyo. Let's say you are departing Tokyo Station, and want to arrive in Shin-Osaka. If you look towards the right of TOKYO, you will see numbers such as 600, 616, 626... These are the departing times from Tokyo. Keep in mind they are listed in military time (1500 would be 3:00pm). Let's say you are interested in getting on the 6:26 train. Above the 626, you will see "H" and the number 501. "H" stands for HIKARI, which is the name of this bullet train. 501 is the train number. You can see what the other alphabets stand for, at the very bottom of the time table. If you look downwards from 6:26, you will see the times of which the train will depart at the other stations. Right after Tokyo would be Shinagawa (6:34 departure), then Shin-Yokohama (6:46 departure), and so on. If you see a check mark, that means that this train will not stop at that station. Other logo marks are explained at the bottom of the timetable. Keep going down, and you will see that the list of times will end at 9:30 at Shin-Osaka. This will be the last stop for this specific train. If your destination is beyond Shin-Osaka, this train will not work for you, or you would need to transfer onto another bullet train. Now let's say you wanted to arrive at Okayama at around 2:00pm (14:00). Find OKAYAMA on the list of stations on the left, and move towards the right. Try to find a time close to 1400. The closest I can find is 1415. If you look upwards from the 1415, you can find the departing time from Tokyo which is 1050 (Nozomi #107). Once you figure it out, it's pretty simple. If you are planning to use a Japan Rail Pass, keep in mind that the pass is not valid for NOZOMI and MIZUHO bullet trains, so avoid any trains with an "N" or "M" at the top. Enter your departing and arriving stations, and your ideal departure or arrival time, and it will give you detailed instructions on how to get there. April 25, 2017 / Amnet New York, Inc. When traveling from one place to another within Japan, sometimes your luggage can become a huge hassle (especially for those who want to take a large suitcase to fill with shopped goods!). You will come across many obstacles such as stairs going up and down, long walking distances and narrow aisles to walk through. You are planning to travel from Tokyo to Osaka by bullet train, but your luggage can get in the way due to limited space on the train. Bullet trains do not provide any extra space for big suitcases either. At times like this, just ship out your luggage in the morning, and retrieve it the next day at your destination. You are spending your last few nights in Osaka, but need to get back to the airport in Tokyo by bullet train etc before boarding your international flight back home. In such cases, you can ship out your luggage and have it reach the airport directly. There is an office located inside the airport designated only for shipping and picking up luggage. Just stop by before checking in for your flight and pick up your suitcase! Prices are determined by weight, size and destination, and delivering companies will vary. Hotels will usually have a form (shipping label) for you to fill out, which you can write in English. Be sure to have the address and phone number of your destination! April 17, 2017 / Amnet New York, Inc. There is a place we recommend for a visit when you have a long layover at Narita Airport. The location is easy to access: only 2 stations away on the JR or Keisei line from Narita Airport (Terminal 1). From there, it's in walking distance. This is the 2nd popular temple in the country where people go to pray for New Year's day (hatsumode), and it attracts roughly 2900000 people. It is also a popular spot among visitors from overseas, especially because the streets and small buildings that lead to the temple from the station has an old, historical mood as if you had slipped back in time, and is very enjoyable even for just a stroll. Keep in mind that there are long hills, so it may be a little hard if you have any physical disabilities. Along these streets are small souvenir shops and restaurants for you to stop by. One of the famous delicacies of the area is the eel. Some restaurants perform the cutting of live eel at the front of the shop, which may be slightly shocking for foreign visitors, however people seem to always take pictures and videos! At the entrance of the temple, there is a very steep flight of stairs. You can take a longer path that goes around it if you are unable to climb these stairs. At the top of the stairs, you will be greeted by the main building, along with the pagoda. In the rear is a beautiful garden as well. Check their official website (in English) to find detailed information! April 10, 2017 / Amnet New York, Inc.
As a Japanese travel agency, we receive inquiries for all types of travel plans to Japan. One of the interesting inquires we received in the past was from a baseball referee, who wanted to take his junior team to visit Japan. We would think that there are many young Japanese baseball players who dream of visiting the US, the home of major league baseball, but in this case it's the opposite. We did some research on any unique places in Japan to take a baseball team for sightseeing, and found this "baseball shrine". One of our agents went for an inspection. This shrine is called the "Yakyu- Inari Jinja", and is located in Yakyu-cho, Higashi-matsuyama City, Saitama Prefecture. "Yakyu-" （野球）in Japanese means baseball, and although the kanji characters are different, they referred the term "baseball" to the name of the area "Yakyu-"（箭弓）. Naturally, this shrine has many visitors who are involved with baseball. Most of the ema have hand-written wishes that are related to baseball as well. Typically, emas are small wooden plates shaped like a house, but at this shrine, their emas are flipped upside-down to look like a home base. They also sell baseball bat-shaped emas. Even the amulets are shaped like bats and gloves! Our client was very excited when he saw a photo of these bat-shaped amulets. Feel free to contact Amnet for any unique travel inquiries you have! The bullet trains Nozomi, Hikari, Kodama, Mizuho and Sakura runs in either or both sections of the railway networks called the Tokaido Shinkansen Line and/or Sanyo Shinaknsen Line, which are divided into different sections with different companies that regulate them. The Tokaido Shinkansen is the swift Japanese bullet train line that run between Tokyo and Shin-Osaka. Regulated by the Central Japan Railway Company (JR Central), the 3 Shinkansens that run throughout the Tokaido line includes the Nozomi (the fastest among the 3 bullet trains), Hikari, and the Kodama. The Sanyo Shinkansen is another network of swift bullet trains between Shin-Osaka to Hakata (Fukuoka City), which are 2 of the biggest Cities toward the west areas of Japan. The locomotive services throughout the Sanyo area is controlled by the West Japan Railway Company (JR West) excluding the area of Shin-Osaka which is regulated by the JR Central. 5 of the Shinkansens that run throughout the Sanyo line includes the Kodama, Nozomi, Hikari (3 of which also run in the Tokaido areas), Mizuho and Sakura. The Nozomi is the swiftest train among the Tokaido/Sanyo Shinkansens. Its stopping points are limited to the amplest of train stations between Shin-Osaka and Hakata. Nozomi's fastest train edition, the N700 series travels from Tokyo to Shin-Osaka (a distance of 515 km) in roughly 2 hours & 22 minutes, sustaining its rate of movement at 168 mph (270 km/h). The Mizuho bullet trains include the JR West & JR Kyushu's N700-7000 & N700-8000 series running between Shin-Osaka & Kagoshima-Chuo. These series include train sets of 8 cars by its quickest travel time at 3 hours & 45 mins, a few of them being 25 minutes faster than the Sakura bullet trains. Hikari are swiftly traveling locomotive service running within the Tokaido & Sanyo Shinkansen lines. This train makes more stops compared to the Nozomi, but it reaches destinations faster than the Kodama shinkansen, which makes even more stops. *Hikari is the quickest bullet train that the JR pass covers. The train name "Kodama" is interpreted as the word meaning "echo". This train comes to a halt at all stations that the Nozomi passes on its route inside the Tokaido/Sanyo Shinkansen. This makes this locomotive service the slowest of all shinkansens, and are used mainly to transfer between minor stations such as Atami in Shizuoka Prefecture. Train goers within exclusive towns, such as Tokyo & Osaka popularly travel on the Nozomi or Hikari transportation suppliers, making smaller amounts of stopping points. Regulated by the JR Kyushu, the Sakura Bullet Train travel within Shin-Osaka and Kagoshima-Chuo. The Sakura route and destination are similar to that of the route the Hikari takes where both of the trains stop in Shin-Kobe, Okayama, Hiroshima, Kokura, Hakata, Kumamoto and Kagoshima etc. These series reach the maximum speed of 186 mph (300 km/h). Its "tilting capability", with the max tilt of one degree of the train due to its tracks, allows for the train to keep a stable speed of 168 mph (270 km/h) when passing curves. It also has the fastest acceleration ability. These series reach the maximum speed of 177mph (285km/h). These series are the only trains without a smoking room, only when running in links of 8 cars. The bullet trains will run in links of either 8 cars or 16 cars. Depending on how many cars there are, your boarding location at the platform will differ. Please make sure to refer to the printed signs on the ground or the panels above your head, as they will indicate your boarding locations. The difference between bullet trains that are valid with the JR pass (Kodama, Hikari, Sakura) and the invalid trains (Nozomi, Mizuho) is that the valid JR pass locomotives tend to have more stopping points, which stops at minor stations when compared with the Nozomi or Mizuho services. Although the extent of its maximum speeds are roughly identical, the time towards the destination differs as one group of trains stop less than the other. One may be able to relish in an euphoric traveling experience in a building at the heart of Tokyo metropolis, the Hokutosei Train Hotel. Just last year in August, the Night train, or bed equipped limited express train called the Hokutosei (北斗星 - translated in English as the Great Dipper), closed its services, yet its train ambiances may be relived once again having its predecessor's furnishing intact on the night train style stationary hotel called the "Train Hotel Hokutosei". The sleeper-train modeled hotel opened in the town of Bakuro, Nihonbashi region of Tokyo Prefecture on December 15, 2016. The Train Hotel Hokutosei consists of identical interior as its ancestrally-based Hokutosei Night Train where travelers are able to sleep towards a tranquil & reminiscing journey both in the physical realm and the dream world, similar to the like-wise levitated sensations that may be possible from the recreating efforts by the locomotive hotel at Bakuro. The Train Hotel Hokutosei consists of the same type of beds and couches used within the Great Dipper Night Train, as well as its bunk beds and half-sized private rooms utilizing the "Shindai Royal" or royal bed. In the lounges are where the train-oriented dining hall's chairs and tables are in use. The hotel also re-utilizes sensitive components of information guidance displayed on bathroom doors based on a helpful idea from its previous locomotive generation. The hotel has a total of 78 beds with the price of 2500 yen for a one-night stay per customer. Although the hotel has gathered English speaking staff in preparation for valued foreign customers, so far the advanced booking of patrons are filled mostly with guests that are most possibly native Japanese railroad fans. It takes around 5 mins by the Sobu Line, from Tokyo Station to Bakurocho Station. The hotel is directly connected to this station, from exit #4. 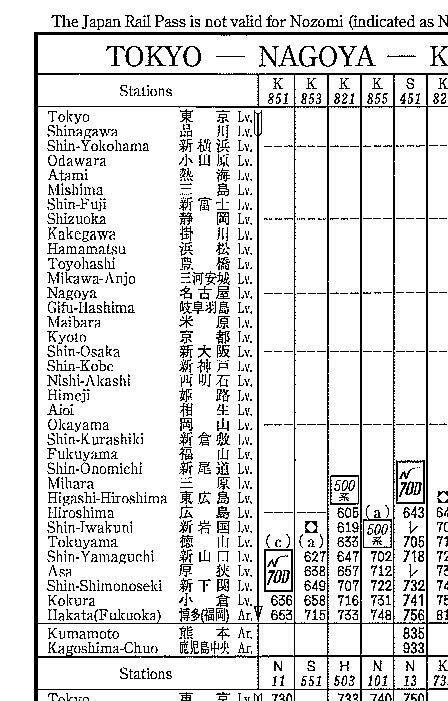 In relation to a Japan Guide article about shinkansen seats, while all purchased green-sha seats are reserved accordingly for individual guests, in ordinary seats individual travelers can choose to sit in the non-reserved sections of the bullet train, on shinkansens that offer them. The Tohoku Shinkansen and Hokkaido's Hayabusa, Hayate and Komachi passenger transports as well as the Hokuriku Shinkansen named Kagayaki do not provide non-reserved seats. In contrast, all shinkansens provide a reserved seating. For Futsusha seats or ordinary cars, customers can often choose to purchase a reserved or non-reserved seat. Conforming to a Japan Talk column about Shinkansen seats, Jiyuseki are under a first come, first choice policy meaning that whoever occupies a seat first through the time which one would reside on the seat is considered to sit through that particular spot until arriving at one's destination point. People traveling in groups may not be able to sit together when using the jiyuseki during peaking shinkansen seasons when the demand for the bullet trains are high. Also, during these times of high seasons, such as holidays (Obon, Golden Week, Silver Week, Oumisoka [Japanese new years], Sanrenkyu [Three day weekend], etc.) Jiyuseki voyagers may want to prepare for the crowded line while passengers wait to board the bullet trains. Non-reserved seats cost less than the reserved seat. For instance, on the Nozomi Shinkansen for the Tokaido/Sanyo Shinkansen lines, train journeyers going from Shinagawa to Kyoto, at the total expedition time of around 2 hours, would pay a basic fare of 8,210 yen which is considered to be the price of a futsusha carrier. An additional charge of 5,700 yen would be added if one gets a ticket for the reserved section of the Nozomi Shinkansen, on the same trip prior, totaling up to the price of 13,910 yen. Shiteiseki are often more calming than the non-reserved areas. While both reserved and non-reserved seatings offer soft seats and a luggage storage area, where one may place their luggage(s), there are much less contenders wanting to place their respective baggage(s) in shiteiseki locations. Reserved seats are predetermined as each attending guests for the trip must occupy their designated areas. These seats also cost more then non-reserved seats. For example, for the Hikari and Kodama shinkansen traveling on the Tokaido/Sanyo Shinkansen lines, a trip from Tokyo to Shin-yokohama cost are the added amount from the basic fee of 500 yen & the surcharge of the reserved seat's super-express of 860 yen finalizing the price to be 1,360 yen for a reserved seat ticket (at distance of 28.8 km). From Tokyo to Nagoya at the stretch of 366 km cost a total of 6,260 yen for a non-reserved ticket, but if one were to purchase a reserved seat, the customer would be paying 10,880 yen for the same trip. *Seat reservations for designated seats charge more than non-reserved seats, and yet Japan Rail Pass users can make reservations for free. JR Pass holders can get their tickets at the "Midori no Mado Guchi" ticket offices, these ticket offices are characterized by a green sign, located at respective train stations. *The basic seat fee is determined by seasons, or by the volume of people using the bullet train, which makes the fees vary from 320, 520, 720 yen. *The shinkansen fees are determined by the distance traveled and other surcharges that may be included depending on the type of seating purchased etc. In accord with the informative web column on Japan Guide, 3 out of the 4 main islands of Japan are linked by a system of highly swift railway trains called the Shinkansen (新幹線), or referred as bullet trains in English. The maximum performance in which some of these trains travel, while customers are boarded, is referenced at averaging speeds of 320km/h or 200mph. The Shinkansen, like relatively all train services in Japan, are known for its timely manner (scheduled arrivals), comforting travels (in terms of travelers inside experience a generally quiet atmosphere) safety record (in its 50 years history there has not been any fatality of passengers caused by colliding accidents or by the train leaving its tracks) and for its concise productivity and/or efficiency. Cost-reduced Japan Rail Passes make traveling on the Shinkansen an optimum choice in terms of expenditure and for safe traveling. A JR pass allows one to travel on the Hikari Shinkansen, the second fastest of commercial bullet trains, as many times as one pleases throughout the designated time in which they have selected until the pass's expiration date. Ordinary Seats, or Futsusha in Japanese, are the common seats that exists in all operating bullet trains. These sitting areas are comparable to the seats of the economy class on commercial airplanes. Futsusha seats are ordinarily cozy offering a sufficient amount of foot space. These seats are most often provided in either reserved or non-reserved seats. All ordinary seats are arranged in sequences of 3x2 (google maps view of what a typical ordinary seats for the Tohoku Shinkansen looks like). Green-sha are similar to that of the business class on commercial airplanes, and likewise provide roomier and cozier seat settings in comparison with the standard seating (futsusha). The Green car are organized in arrays of 2x2 (glimpse of what the green-sha generally looks like on the Tohoku Shinaknsen). All of the green-sha seats are reserved. A newer seat setting has also been introduced by certain bullet trains called Gran Class. These carriers are established in configurations of seats with a 2x1 pattern, and are relatable to those of the first class sections of commercial airplanes. Futsusha bullet train prices, on the Tokaido/Sanyo Shinkansen (railway line operating between Tokyo & Shin-Osaka), ranges (based on surcharges & distance of travel) at around 170 yen (from Tokyo to Shinagawa, at the distance of 6.8 km) to 11,660 yen (from Tokyo to Hiroshima, at the distance of 894.2 km) as basic fare prices (not including surcharge). *For Green cars an additional charge of above the price of 2,250 yen is applied on top of the cost mentioned above. *Note that the prices are intended for a one time travel to and from the respective locations. *Travelers using wheel chairs can be accommodated on most of the Shinkansens and limited express trains by contacting the station, two days before one's journey, in which one plans to board. Japanese manhole covers are among one of the uniquest of the countries in regards to the states efforts to promote its art work and its success. The decorations on the orb-shaped picturesque caps connect with its area presenting itself as an image or symbol of its residing region. According to a Japan Times article by Mizuho Aoki, heavily designed Japanese manhole covers have become popular in Japan along with its free collectible cards released during April of this year (to further promote the sewage coverings) by Japan's Sewage Promotion Platform, the GKP or referred in Japanese as the Gesuido Kho Purattoformu. The GKP organization produced many more of its collectibles adding on 30,000 additional edition due to the cards towering fame. The story behind the cover's decorative turn started in the 1980s when Japan's cities started to encourage a positive image for Japan's sewage systems. The manhole artists, who are the manhole cover manufactures, sends their blue print manhole drawings to its affiliated city where town representatives pick out there most preferring design and authorizes its production. Manhole enthusiasts or fans, who collect photos and information about the coverings, test their knowledge by hypothesizing on why particular images were chosen to represent itself as manhole designs, where the portraits are most usually correlated to its area. Decorations on manholes differ by city to city in Japan. The manhole's art corresponding to its city is very unique compared to other countries with beautiful manhole craftsmanship. Manhole partisans have a variety of ways in capturing the recordings of the circular art covers from taking pictures to some going to lengths by making inked paper-imprints of the circular subterranean covers. In an article from Colossal on Japanese manholes by Johnny Strategy, describes a further reason behind the start to a more frequently produced artful underground covers. The website writing indicates that the explanation for the evolution of Japanese manhole configurations were attributed with the municipalities' efforts to satisfy the public while there were concerns on the city's raising taxes toward pricey sewage operations. The Colossal composition further illustrates that, in behalf of artist contenders and pictured issues that followed one after another, the flush aesthetic coverings took its startling leap toward a favorable trend. A few years ago roughly 6000 visually technical manhole lids were reported all over Japan by the "Japan Society of Manhole Covers". One of their discovery includes a classification for pictured sewage cover's design, the most common being tree illustrations, following optic representations of landscapes, flowers and birds - the pictorial iconographies all encourage the wellness and the individuality of their respective towns thus advertising their municipal area in its own exclusive manner. An editorial on the Kuriositas website "about the art of Japanese Manhole", introduces a quote from English Philosopher, Jermey Bentham, where he casts in writing that "stretching [one's] hand up to reach the stars, too often [one] forgets the flowers at [its] feet." The cited words is meant to interconnect with the description of how Japan's structural elaborations plays a part to the little aspects of the city's overall structures and perhaps leave one marveled by seeing the humbling circular decorations on the ground. The ornate, but self-effacing manhole perhaps is, in this case, one of the prime examples of Japan's thorough designs that exist throughout its establishment. Evidently, it's perhaps the creative expenditure put into the manholes and its competition between respective artists and cities that have incited devotees and have cultivated into its own faming culture. JR East Japan Railway Company is offering discounted round trips between Narita Airport Terminals 1, 2, 3 and Tokyo (including Shinagawa, Shinjuku, Ikebukuro, Yokohama, Omiya and Ofuna Station) for foreign visitors (limited to non-Japanese passport holders). N'EX Tokyo Round Trip Ticket prices for Adults (ages 12 and up) is 4000 yen and for children (ages 6-11), 2000 yen. Without purchasing N'EX Tokyo Round Trip Tickets, regular round-trip costs for adults (age 12 and over) vary from 6,040 yen to 9,420 yen. The round trips are of "direct access" to and from Narita and Tokyo with approximately 1 hour travel time without any transfers. There are an abundance of trains that the valued clients using N'EX can take with trains operating at intervals of roughly 30 minutes. *When purchasing these discounted tickets, the passenger would have to make seat reservations. This can be done at the JR East Travel Service Center located at Narita Airport's Terminal 1, 2, or 3. *The ticket's expiration date is 14 days. One may buy more than one ticket as long as the ticket date of one's one or more purchases do not interact with the ticket's validity of 2 weeks. For example, I may buy a ticket and then another one that does not interact with the 14 days of the first ticket's validation through expiry. *These tickets can be purchased one month prior before a person uses their round-trip ticket.